Tehillim / Psalms 125, ספר תהילים קכה, Part 2, Do You have a Deep Desire to Pursue God? In this week’s study from Tehillim / Psalms 125:1-5, the psalm opens saying, א שִׁיר הַמַּעֲלוֹת הַבֹּטְחִים בַּיהֹוָה כְּהַר-צִיּוֹן לֹא-יִמּוֹט לְעוֹלָם יֵשֵׁב: A Song of Ascents. 125:1 Those who trust in the Lord Are as Mount Zion, which cannot be moved but abides forever. (NASB) It is very interesting how the psalmist declares, those who trust in the Lord are Mount Zion which cannot be moved but abides forever. What does it mean Zion abides forever? The psalmist continues saying, ב יְרוּשָׁלַם הָרִים סָבִיב לָהּ וַיהֹוָה סָבִיב לְעַמּוֹ מֵעַתָּה וְעַד-עוֹלָם: ג כִּי לֹא יָנוּחַ שֵׁבֶט הָרֶשַׁע עַל גּוֹרַל הַצַּדִּיקִים לְמַעַן לֹא-יִשְׁלְחוּ הַצַּדִּיקִים בְּעַוְלָתָה יְדֵיהֶם: 125:2 As the mountains surround Jerusalem, So the Lord surrounds His people From this time forth and forever. 125:3 For the scepter of wickedness shall not rest upon the land of the righteous, So that the righteous will not put forth their hands to do wrong. (NASB) The mountains are understood as being solid and as a wall of protection to the people, with the Lord God in heaven being paralleled to its strength. The psalmist believes in the importance of doing what is right according to God’s Torah has having benefits for the child of God. The benefit is in the Lord working in the life of the unrighteous person to protect the righteous from harm. This is further illustrated by what the psalmist states, ד הֵיטִיבָה יְהֹוָה לַטּוֹבִים וְלִישָׁרִים בְּלִבּוֹתָם: 125:4 Do good, O Lord, to those who are good And to those who are upright in their hearts. (NASB) The point is to be righteous in all of areas in our lives. We are to be innocent in our hearts in all that we do. The Psalm concludes saying, ה וְהַמַּטִּים עַקַלְקַלּוֹתָם יוֹלִיכֵם יְהֹוָה אֶת-פֹּעֲלֵי הָאָוֶן שָׁלוֹם עַל-יִשְֹרָאֵל: 125:5 But as for those who turn aside to their crooked ways, The Lord will lead them away with the doers of iniquity. Peace be upon Israel. (NASB) Notice how the psalm speaks of turning aside to one’s works of iniquity (פֹּעֲלֵי הָאָוֶן) (crooked ways). The psalmist states that for such a person, the Lord will lead them away with the doers of iniquity. This suggests that we are not given a “get out of jail” tick for free. We have a certain responsibility as the people of God to walk in God’s Ways! This means we do not pursue wickedness, unrighteousness. We are called to be a people of Teshuvah (Repentance). The point is we should have within our hearts the desire to pursue the Lord God and His Messiah Yeshua. The rabbis have the following to say concerning our psalm and Zion in the Talmud Bavli Berekhot 58b. אמר ליה הכי אמר ר’ יוחנן מיום שחרב בית המקדש נגזרה גזירה על בתיהן של צדיקים שיחרבו שנאמר (ישעיהו ה, ט) באזני ה’ צבאות אם לא בתים רבים לשמה יהיו גדולים וטובים מאין יושב ואמר ר’ יוחנן עתיד הקדוש ברוך הוא להחזירן לישובן שנאמר (תהלים קכה, א) שיר המעלות לדוד הבוטחים ביי’ כהר ציון מה הר ציון עתיד הקדוש ברוך הוא להחזירו לישובו אף בתיהן של צדיקים עתיד הקב”ה להחזירן לישובן חזייה דלא מיישב דעתיה א”ל דיו לעבד שיהא כרבו Ulla said to Rav Ḥisda: You have nothing about which to sigh, as Rabbi Yoḥanan said as follows: From the day that the Temple was destroyed a decree was issued upon the houses of the righteous that they would be destroyed, as it is stated: “In mine ears said the Lord of hosts: Of a truth many houses shall be desolate, even great and fair, without inhabitant” (Isaiah 5:9). And Rabbi Yoḥanan said: In the future, in the end of days, the Holy One, Blessed be He, will restore them to their original locations and their inhabited state, as it is stated: “A Song of Ascents of David. They who trust in the Lord are as Mount Zion, which cannot be moved but abides forever” (Psalms 125:1). From this verse one may infer that just as in the future the Holy One, Blessed be He, will restore Mount Zion to its inhabited state, so too, in the future the Holy One, Blessed be He, will restore the houses of the righteous to their inhabited state, so you have no reason to sigh. Seeing that he was still not satisfied, Ulla said to him: It is enough for a servant to be like his master. Since God leaves His home, the Holy Temple, in ruins, one should not be distraught over the destruction of the houses of the righteous. The Talmud speaks of the unmovable nature of Mount Zion and of the Lord at a future time restoring this place to His people. They say this restoration will go to the righteous. The righteous will be like the master, our Father in heaven who is righteous and holy and just. Note also the Apostolic Writings teach us that those who remain in the Messiah Yeshua will abide forever. The Holy Temple remains in ruins because of the lack of these things in the hearts and lives of God’s people. The hope and expectation however is of the Lord working in our lives and of the restoration of His people to that sacred place. לז) הר ציון לא ימוט, לעולם ישב (תהלים ק״ה) – וכן צדיק לעולם בל ימוט (משלי י״א) וכמובא במדרש: מה שאידע ליוסף אירע לציון. (Ps. 125:1) “Mount Zion never falters, but abides forever” — Likewise, a righteous person never falters (Prov.12:6). As brought in the Midrash: whatever occurred to Yosef, occurred to Zion. The commentary speaks of Mount Zion never failing and abiding forever, just as the righteous endure through all things with the help of God. Mount Zion as a geographical area is currently the center of much dispute. The Scriptures and the Rabbinic Literature are clear that, one day, Zion is the sole possession of the Lord God of Israel, and that he will one day restore Zion to the nation of Israel. We read the following in Scripture, “the children of your oppressors will come bowing before you; all who despise you will bow down at your feet, and will call you the City of the LORD, Zion of the Holy One of Israel” (Isaiah 60:14) and “Awake, awake, Clothe yourself in your strength, O Zion; Clothe yourself in your beautiful garments, O Jerusalem, the holy city; For the uncircumcised and the unclean, Will no longer come into you” (Isaiah 52:1). Isaiah says the enemy will recognize the place the Lord has established His name and do so by paying homage to the people of God. The Aramaic Targum states, א שירא דאיתאמר על מסקיין מסוקין דתהומא צדיקיא דמתרחצין במימרא דיהוה היך טורא דציון לא יזדעזע לעלם יתיתב׃ 125:1 A song that was uttered on the ascents of the abyss. The righteous who trust in the word of the Lord are like Mount Zion; it will not totter, it is inhabited forever. (EMC) The establishment of God’s name in His people is illustrated by His people bearing the testimony of God. This is synonymous to trusting in the word of the Lord, and applying God’s Word to our lives. The psalmist continues saying, ב יְרוּשָׁלַם הָרִים סָבִיב לָהּ וַיהֹוָה סָבִיב לְעַמּוֹ מֵעַתָּה וְעַד-עוֹלָם: ג כִּי לֹא יָנוּחַ שֵׁבֶט הָרֶשַׁע עַל גּוֹרַל הַצַּדִּיקִים לְמַעַן לֹא-יִשְׁלְחוּ הַצַּדִּיקִים בְּעַוְלָתָה יְדֵיהֶם: 125:2 As the mountains surround Jerusalem, So the Lord surrounds His people From this time forth and forever. 125:3 For the scepter of wickedness shall not rest upon the land of the righteous, So that the righteous will not put forth their hands to do wrong. (NASB) The Aramaic Targum states the following, ב ירושלם טוריא חזור חזור דילה ומימרא ושכינתא דיהוה חזור חזור לעמיה מן השתא ועד עלמא׃ ג ארום לא ינוח שבט רישעא שבטא דעשו רשיעא על פיצתא דצדיקיא מן בגלל דלא יושיטון צדיקיא בשקרא אידהון׃ 125:2 Mountains are round about Jerusalem, and the word of the Lord is round about his people from this time and forever. 125:3 For the scepter of wickedness will not rest on the lot of the righteous, so that the righteous will not stretch out their hand to deceit. (EMC) The mountains are understood as being solid and as a wall of protection to the people, with the Lord God in heaven being paralleled to its strength. The psalmist believes in the importance of doing what is right according to God’s Torah as having benefits for the child of God. The benefit is in the Lord working in the life of the unrighteous person to protect the righteous from harm. The prophets Isaiah, Amos, Hosea, and Micah, all prophesied at about the same time, telling the people of Israel that if they considered themselves God’s special people living under His protection, then they should live according to His ways, being obedient to His Torah. The problem was they were not doing according to God’s Torah. Each of these prophets spoke of a future expectation of the ‘last days,’ a time when the people would obey God, trust in Him, and when He would take control in power and sovereign authority in men’s lives. Hosea 2:5 states, “the time will come when the sons of Israel shall return and seek the Lord their God and David their king, and in the end they will come in awe to the Lord and his goodness.” Amos 9:13-15 says, “The days are coming, the Lord declares, when the ploughman will overtake the reaper, and he who treads the grapes will overtake the sower, when the mountains are wet with new wine, and the hills grow soft with it. That will be when I bring back the exiles of my people Israel, to rebuild deserted cities and live in them, to plant vineyards and drink their wine, to make gardens and eat their fruit. And I will plant them in their own land. Never again shall they be uprooted from the land which I gave to them. The Lord, your God, has spoken.” In addition, Isaiah 2:1-4 at the beginning of his prophecies, speaks of what he saw concerning Judah and Jerusalem saying, “In the last days the mountain of the Lord’s temple will be established as chief among the mountains, raised above the hills, and all nations will stream into it. Many peoples will come and say, ‘Come, let us go up to the mountain of the Lord, to the house of the God of Jacob. He will teach us his ways, so that we may walk in his paths’. The law will go out from Zion, the word of the Lord from Jerusalem. He will judge between the nations, settle disputes for many peoples. They will beat their swords into ploughshares, and their spears into pruning hooks. Nation shall not take up sword against nation, nor will they train for war any more.” This vision is of the greatness and majesty of Zion, the place in which the Lord has established His Name. Isaiah speaks of his own nation, of what would be the situation when the Lord God acted and God’s people behaved as they should obeying His Torah from the correct motivation of heart. This vision includes all the families of earth being blessed. The response which Isaiah urged upon the people was “Come O house of Jacob, let us walk in the light of the Lord.” When we consider the meaning of light and darkness in the Scriptures, to walk in God’s light is to walk according to His mitzvot (commandments) which was counter to the way they were currently behaving. He had a vision of a future state, something the Lord God would eventually do and the people were to live in obedient response. Micah 4:1-4 states, “Every man shall sit under his own vine and under his own fig tree, and no one will make them afraid for the Lord Almighty has spoken.” Micah states that God’s rule is not just the politics of who is in authority, but results in simple blessings for ordinary people. His response is different from Isaiah’s, which is opposite to “Let us walk,” an exhortation, but says instead, “We will walk,” which is indicative of a promise as he says, “All the nations may walk in the name of their gods, but we will walk in the name of the Lord our God for ever and ever.” In a world of many nations and many religions (gods), this is a pledge of loyalty to the Lord our God. Note again how walking in the name of the Lord our God is to do so according to His Torah! The giving of God’s Torah to His people is the ultimate triumph of God’s grace towards Israel! Mount Zion symbolizes the unique authority and relationship with God throughout the Scriptures. This is not only connected to His people, but also to the Gentiles who will come to worship the Lord God in heaven (Isaiah 2). The Gentiles will come to the mountain of the Lord to be taught by the Lord concerning His salvation and truth that leads to a life that serves and pleases God! This points to men being at peace with God and with one another, since the Torah mandates these things upon the lives of the people. Paul used the Torah to describe to us the last days (2 Timothy 3:1) that as we start approaching the end times, the love of many will grow cold and lawlessness and immorality will abound. He also says that men will become lovers of self and money, along with becoming unholy, blasphemers, unloving, unthankful, disobedient to parents, unforgiving, slanderers, without self-control, traitors, headstrong and lovers of pleasure rather than lovers of God. This sounds like a very serious decline in the moral state of the world. This is exactly what we are seeing today in this world, in our country, and in our local communities. The point is, as bad as the moral state of man is right now, it is going to get a lot worse in the coming years according to the words of Paul. Paul wrote, 3:10 Now you followed my teaching, conduct, purpose, faith, patience, love, perseverance, 3:11 persecutions, and sufferings, such as happened to me at Antioch, at Iconium and at Lystra; what persecutions I endured, and out of them all the Lord rescued me! 3:12 Indeed, all who desire to live godly in Christ Jesus will be persecuted. (NASB) Those who choose to live for the Lord will be persecuted. In the Apostolic Writings, Yeshua says, “Neither in this mountain nor in Jerusalem will you worship God, but in spirit and in truth.” (John 4:21-23) speaking of worshiping the Lord not in Samaria but in spirit; and not in Jerusalem but in truth. He also said, “This people honors me with their lips but their heart is far from me.” (Matthew 15:8). Our service and worship of the Lord is found within the motivation of our hearts. The Lord does look at our hearts, He also looks at our actions since our actions are the product of what is in our hearts. Notice how Paul speaks of the gifts, calling, and mercy of God that is connected to our presenting our bodies as a living sacrifice before God. Now what is this referring to and how might this be accomplished? Paul is speaking of the application of the Torah to our lives. The reason we know this is because Paul wrote of being a “living” sacrifice, since sacrifices usually resulted in the death of the animal. The Torah descriptions of the sacrifice was to lay on the altar the parts of the animal and the priest was to eat a portion of the sacrifice to bear the iniquity of the people. In Romans 6 (verses 13, 16, 19) Paul speaks of presenting our bodies, our members, to God like this, and in every case it is so that our members (our arms, legs, tongues, eyes, ears, and sexual organs) would become instruments of righteousness. So the sacrifice is not only living, it is moving about and doing things in this world. This is the definition of applying God’s words to our lives. The sacrificial portion of obeying God’s Torah is to humble our lives before God according to His Word. Note how Paul writes, “Present your bodies . . . holy and acceptable to God.” He defines this saying, “use your renewed mind to prove what is the will of God, what is good, acceptable and perfect.” So there is a connection between offering your body to God as an acceptable sacrifice to God, and doing the acceptable will of God. We know what the will of God is. His will is laid out in the Scriptures, in the Torah, where all of the scriptures are a commentary upon the Torah! Note in these Scriptures (Romans 12:1) there is a negative and positive command. The negative command is not to be conformed to this world. The positive command is to be transformed by the renewing of your mind. The renewing of the mind is achieved by studying God’s Word, placing His word upon our hearts. To not be conformed but being transformed is devoting our lives to the Lord, to His Word, and to being changed. Most people of faith tend to “coast along” in their relationship with God and spiritual growth. We are called to be transformed, which is an on-going growth process, which involves Teshuvah and seeking the Lord daily. The occurrence of change in our lives is on a moral and ethical basis. Ethics and morality hold the highest place in Judaism. Therefore, when we seek to do the will of God, to live our lives for Him, we look at what the World is doing, and 9 times out of 10, it is related to moral and ethical living. Paul says, “Be transformed by the renewing of your mind.” The focus is upon being cleansed on the inside (Teshuvah) and being transformed, our hearts motivating us to be transformed on the outside for all to see as a testimony to the Lord God in heaven. It is the renewed mind that enables us to “prove what the will of God is.” The key word is “prove.” Note how a proof text is a rabbinic way of thinking (see the rabbis in the Midrashim). The proof speaks to us of testing and proving something at the intellectual and the textual levels. By examining our ways and our heart, we are able to access and approve the value of something when we see it. (Romans 12:2 And do not be conformed to this world, but be transformed by the renewing of your mind, so that you may prove what the will of God is, that which is good and acceptable and perfect. NASB) The point is about conforming our minds to right thinking. To treasure the Word of God, to always be thinking upon what is right, and to love one another. Note that this renewal process is not a logic lesson, but about the transformation which enables us to recognize what the Scriptures say and be able to reasonably apply God’s word in our lives. The basic premise is, no one born of God makes a practice of sinning. This is the danger of practicing sin, the heart being hardened to the point of no return. Many people tend to drift away from the Lord because of their sins. This is the danger and the reason for the warning given to us in the Torah about sin, because the sin in one’s life can cause us to feel guilty and lead us away from the Lord. In Parashat Haazinu, the song of Moshe in Devarim / Deuteronomy 32, Moshe calls heaven and earth as witnesses, Moses exhorts the people saying, ז זְכֹר יְמוֹת עוֹלָם בִּינוּ שְׁנוֹת דֹּר וָדֹר שְׁאַל אָבִיךָ וְיַגֵּדְךָ זְקֵנֶיךָ וְיֹאמְרוּ לָךְ: ח בְּהַנְחֵל עֶלְיוֹן גּוֹיִם בְּהַפְרִידוֹ בְּנֵי אָדָם יַצֵּב גְּבֻלֹת עַמִּים לְמִסְפַּר בְּנֵי יִשְֹרָאֵל: “Remember the days of old, to Consider the years of the previous generations, and to ask your fathers and they will recount it to you and they will tell you how the Lord God was with them in the desert, made them a people, chose them as His own, and promised them a land filled with milk and honey.” (32:7-8) The song also warns against the deception of wealth saying טו וַיִּשְׁמַן יְשֻׁרוּן וַיִּבְעָט שָׁמַנְתָּ עָבִיתָ כָּשִֹיתָ וַיִּטּשׁ אֱלוֹהַּ עָשָֹהוּ וַיְנַבֵּל צוּר יְשֻׁעָתוֹ: “Jeshurun grew fat and kicked, he has grown fat, thick, and round, he forsook God who made him and spurned the Rock of his salvation.” (32:15) Moshe warns of the terrible calamities that would result due to disobedience which is juxtaposed to the blessings and the curses we had read in the previous Torah portions. Moshe describes what will happen when turning from God towards sin, the Lord will hide His face and look only for our repentance. The nations will come against the abstinent people, and after the people have come to their senses, the Lord God will avenge the blood of His servants, and be reconciled to His people and the Land. The Torah portion concludes with the Lord instructing Moshe to ascend Mount Nebo to view the Promised Land before dying on the mountain saying, “For you shall see the land opposite you; but you shall not go there, into the land which I give to the children of Israel.” (32:52) The reason being, Moshe did not sanctify the Lord by his actions and in his heart before the people. We are called to be a people of Teshuvah (Repentance). We are also called to be a people who sanctify the Lord by our actions and in our hearts before God and the world! This is what it means by our having within our hearts the desire to pursue the Lord God and His Messiah Yeshua. Do you have this deep desire to pursue God and His ways? Let’s Pray! 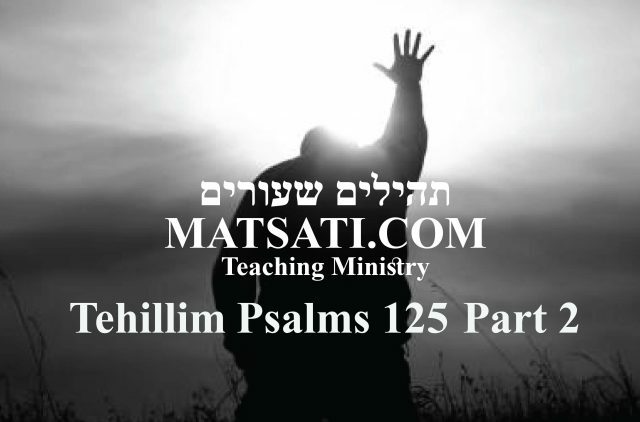 The Rabbinic Commentary (Midrash) on Tehillim / Psalms 125 has 5 parts. Reading through the Midrash we will be looking at Part 1, 2, 3, 4, and 5. Let’s begin by outlining Midrash Tehillim Chapter 125, Part 1, 2, 3, 4, and 5. The נמשל (Nimshal) “expansion on the parable” expands upon the משל (mashal), saying those who trust in the Lord will remain as a solid foundation. The משל (mashal) “the parable,” goes on to explain the פתיחתא (Petihta), the rabbis speak not of our sins causing our calamity, but of the state of wickedness that leads to that end result. The נמשל (Nimshal) “expansion on the parable” expands upon the משל (mashal), saying the rod of the wicked will not rest upon the righteous, where the rod is that of judgement. The משל (mashal) “the parable,” goes on to explain the פתיחתא (Petihta), the rabbis speak of rest and peace before men. The נמשל (Nimshal) “expansion on the parable” expands upon the משל (mashal), saying the wicked will not be at rest in the presence of the righteous. Why do you think that is? The משל (mashal) “the parable,” goes on to explain the פתיחתא (Petihta), the rabbis speak of the One who is eternal and the source of all good, and the righteous receiving from the creator God. The נמשל (Nimshal) “expansion on the parable” expands upon the משל (mashal), saying the application of God’s word is wisdom, and use the example, of the application of Torah to stealing, where one must return what was stolen in order to be reconciled before God. א שיר המעלות הבוטחים בה׳ כהר ציון וגו׳. אמר (רב) ר׳ [יוחנן] מיום שחרב בית המקדש נגזרה גזרה על בתיהם של צדיקים ליחרב, שנאמר באזני ה׳ צבאות אם לא בתים רבים לשמה יהיו (ישעיה ה ט). (א״ר) [ואמר ר׳] יוחנן ועתיד הקב״ה להחזירם לישובן, שנאמר שיר המעלות הבוטחים בה׳ כהר ציון לא ימוט לעולם ישב, מה הר ציון עתיד הקב״ה להחזירו [לישובו], אף בתיהם של צדיקים עתיד הקב״ה להחזירם [לישובן]. 1. They that trust in the Lord will be as Mount Zion, which cannot be removed, but abides forever (Tehillim / Psalms 125:1). Rabbi Johanan taught, From the day that the Temple was destroyed, it was decreed that the houses of righteous men should also be destroyed, as it is said, In My ears said the Lord of hosts, Of a truth many houses of the great and fair will be desolate, without inhabitant (Isaiah 5:9). Rabbi Johanan added, however, The Holy One blessed be He, will restore their houses, as is said A song of ascents. They that trust in the Lord will be as Mount Zion, which cannot be removed, but abides forever. That is, as the Holy One blessed be He, will restore Mount Zion, so the Holy One blessed be He, will restore the houses the houses of righteous men. The rabbis say when the Temple of the Lord is destroyed in Jerusalem, the houses of righteous men will become desolate. This suggests the righteous are no longer occupying their homes. Could this also be a reference to houses of study (beit hamidrash)? What happened with the destruction of the Temple? Men left the study of the Torah to doctrines that were devoid of God’s Torah in the early church. There are a few Scriptures that speak of the house becoming desolate. Isaiah also speaks of the houses of the righteous becoming desolate and abandoned. Notice how the context of desolation and abandonment, are related to the actions of the people, who seek bloodshed, who pursue alcohol in the mornings, who stay up late to drink wine that inflames them, and who do not pay attention to the deeds of the Lord. The people forsook the way of God, forsook His words, and entered into exile due to their lack of knowledge. Isaiah says the grave has enlarged its throat and opened wide its mouth without measure. Those who do these things will go into destruction. Note the importance of serving the Lord, walking in His ways, seeking the Lord daily, and working to do what is right, with the Lord’s help to do so! So, which approach do you take in your walk with God? Complacency, disregard, or a “not important” attitude? Or one that is on fire for God, His Messiah Yeshua, and the ways of the Torah? Here Isaiah sees a vision of heaven and angels and the holiness of God. His vision leaves him desolate and undone because he recognizes how he falls short of God’s righteousness and holiness. The Lord commissions Isaiah to speak to Israel about her having forsaken the ways of God to serve other gods. The angel speaks of those who do so do not have eyes to see, ears to hear, or even the ability to perceive (understand) the message because of their sins. This is an important observation, sin has the capability to deceive one’s own soul (neshamah). Because of these things, the desolation of houses, the abandonment of the houses of study are the result of sin leading the people way from the Lord towards self and fleshly desires. Jeremiah spoke the word of God to the people and they called for his death. Jeremiah spoke of sin and unrepentant sin leading to the destruction and desolation of the house of God. Many times the word of the Lord is not a popular message. This was the counterculture of sin in Jeremiah’s time the people had taken hold of, this culture of sin and rebellion against the Word and the Ways of God. This is what is happening in the world today, a counterculture of disrespect, hatred, murders, immorality, idolatry, and rebellion against the ways of God. A counterculture is a subculture whose values and norms of behavior differ substantially from those of mainstream society, often in opposition to mainstream cultural mores. It is easy to see that the mainstream culture today is not one of Biblical or Christian values. Though society today does not always look with favor on those who are rampantly immoral, idolatrous, and murderous. There is an inherent knowledge these things are bad, the counterculture takes it upon one’s life to popularize sin. As a result, the righteous struggle to strive with society, which leads to the desolate house that has been abandoned. The reason? The righteous move away to places of greater security and safety. Yeshua also spoke of the desolation of the house, and his message was the same as the prophets. Yeshua opens with a series of “woes” because of the hypocrisies in the faithfulness of the leadership in Israel. This hypocrisy is to the lack of justice, mercy, and love in the Lord, because these leaders choose to neglect the weightier parts of the Torah which are mercy and love towards others. This led to their being guilty of the sins of their fathers, to that of murder and even idolatry. Yeshua says because of these things, 23:38 ‘Behold, your house is being left to you desolate! 23:39 ‘For I say to you, from now on you will not see Me until you say, ‘Blessed is He who comes in the name of the Lord!’‘ (NASB) Notice how Yeshua is focusing upon the commands of God in relation to the extent of the peoples sins. Yeshua is teaching Torah, since he is drawing all of these things into the context of what is most important in the Torah, to show mercy and have love for one another. This is why the Torah is a part of the gospel message, we are called to live for the Lord having faith in God and His Messiah! Yeshua speaks of “faithfulness,” this is the point of Torah observance and walking according to the Spirit of God. Midrash Tehillim 125, Part 1 states, “Rabbi Johanan taught, From the day that the Temple was destroyed, it was decreed that the houses of righteous men should also be destroyed, as it is said, In My ears said the Lord of hosts, Of a truth many houses of the great and fair will be desolate, without inhabitant (Isaiah 5:9). Rabbi Johanan added, however, The Holy One blessed be He, will restore their houses, as is said A song of ascents. They that trust in the Lord will be as Mount Zion, which cannot be removed, but abides forever. That is, as the Holy One blessed be He, will restore Mount Zion, so the Holy One blessed be He, will restore the houses the houses of righteous men. ” The midrash speaks of the desolation of the houses of the righteous due to the destruction of the Temple which resulted from the sin of the people. The most important point is the Love of God for His people, which leads Him to calling His people back, restoring their houses, and their places of worship. What the Lord is doing, is putting in the hearts of men the desire to seek Him and His ways. Yeshua said “If you love Me, you will keep My commandments.” (John 14:15, NASB) Yeshua having taught the Torah said the same thing the rabbis say, the greatest commands are loving the Lord God in heaven, having mercy towards others, and loving one another. All of the commands rest upon these things because to love God, have mercy, and loving one another, one would not commit a sin against God or others, as sin is defined as disobedience to the command. Note how these two greatest commands have an additive property in the sense that all of the commands are contained within these commands. Most of Christianity today however views these two greatest commands as having a subtractive property in the sense that with these two commands, all of the rest are null and void. It is obvious the commands are not done away with. The doctrinal problem in the church is a spiritual one of blindness and arrogance (lack of humility). ב כי לא ינוח שבט הרשע. דריש ריש לקיש אין מזווגין לו לאדם אשה אלא לפי מעשיו, שנאמר כי לא ינוח שבט הרשע על גורל הצדיקים. א״ר יוחנן ממה שנאמר ברבקה בתולה (בראשית כד טז), איני יודע שאיש לא ידעה , אלא שאפילו אדם לא תבע בה, על שם כי לא ינוח שבט הרשע וגו׳. 2. For the rod of the wicked will not rest upon the lot of the righteous (Tehillim / Psalms 125:3). Resh Lakish taught, A man is wedded to the kind of woman he deserves, and thus it is said of a wicked woman, The rod of the wicked will not rest upon the lot of the righteous. Rabbi Johanan taught, Since it is said of Rebekah And the damsel was a virgin (Bereshit / Genesis 24:16), is it not all too clear that no man had known her? The intention of these words, however, is to prove that no man had ever approached her with a wicked thought, as is proved by the verse The rod of the wicked will not rest upon the lot of the righteous. In the opening phrases of the midrash, the rabbis make the statement from the Psalm saying the rod of the wicked will not rest upon the righteous, and paralleling this to a man who marries a woman he deserves. There is a rabbinic parable where there once was a pious man who was married to a pious woman; and they had no children. They said, “We are no profit to God,” and so they divorced one another. The man went and married a bad woman and she made him bad. The woman went and married a bad man, and she made him good. The moral of the story is not that the wife is often blamed for marital discord rather than the husband, but that we are to seek the will of God rather than taking matters into our own hands and then being deceived and led astray to destruction. King Solomon said lean not on your own understanding, and the reason being, our own understanding will lead us astray from the righteous ways of God because of the desires of the flesh. The Talmud Bavli Sota 2a however has a differing opinion on this matter. Rav Shmuel bar Rav Yitzḥak says: When Reish Lakish would introduce his discussion of the Torah passage of sota he would say this: Heaven matches a woman to a man only according to his actions, as it is stated: “For the rod of wickedness shall not rest upon the lot of the righteous” (Psalms 125:3), indicating that if one has a wicked wife it is due to his own evil conduct. Rabba bar bar Ḥana says that Rabbi Yoḥanan says: And it is as difficult to match a couple together as was the splitting of the Red Sea, as it is stated in a verse that speaks of the exodus from Egypt: “God makes the solitary individuals dwell in a house; He brings out prisoners into prosperity [bakosharot]” (Psalms 68:7). God takes single individuals and causes them to dwell in a house by properly matching a man to a woman. This is similar to the exodus from Egypt, which culminated in the splitting of the Red Sea, where He released prisoners into prosperity. Midrash Tehillim 125 Part 2 concludes saying, “Rabbi Johanan taught, Since it is said of Rebekah And the damsel was a virgin (Bereshit / Genesis 24:16), is it not all too clear that no man had known her? The intention of these words, however, is to prove that no man had ever approached her with a wicked thought, as is proved by the verse The rod of the wicked will not rest upon the lot of the righteous.” The desirability of keeping a healthy home rests upon each one of our motivations to serve the Lord God in heaven, to seek His ways, and to want His will for our lives, just as we read of the match making process occurring in heaven. The rabbinic conviction is that a wife has a significant influence upon the family, and likewise, with the husband there is the necessity to be a righteous man who seeks the will of God and wants the same for his family. ג [כי לא ינוח שבט הרשע וגו׳]. רבי אבא בר כהנא אמר אין לו נייחא בצד חבורה של צדיקים, אלא בצד חבורה של רשעים, למה לא ינוח שבט הרשע. [ד״א כי לא ינוח שבט הרשע] זה אשתו של פוטיפר, על גורל הצדיקים זה יוסף. 3. For the rod of the wicked will not rest upon the lot of the righteous (Tehillim / Psalms 125:3). Rabbi Abba son of Kahan taught, The wicked finds no restful pleasure in the company of the righteous, but only in the company of the wicked. And the proof? The rod of the wicked will not rest upon the lot of the righteous. Another comment, By the rod of the wicked is meant Potiphar’s wife; and by the lot of the righteous is meant the lot of Joseph. What is the bent of my heart? What captures my attention and my affections? Is it godly things, or is it the ungodly things? Other questions may be, how I spend my money or how do I use my time? These are indicators of which path we have set our feet to walk upon. For example,what are my priorities? Am I choosing to build my life around eternal, godly principles, or am I spending my time and my life with things that do not really matter, with things that, while not evil in and of themselves perhaps, are not cultivating in me a heart to love God more. These things may be helping us to love the world more and its system. The unrighteous persons do not entertain these questions because they do not have a desire to serve God. Note that those who are wicked are not just those who are egregiously, overtly wicked, but include those who are without worship or even thought of the Lord God of Israel at all. Remember our lives are a way of worshiping the Lord and bringing glory to His name. The wicked live their lives in a way that is not centered around the Lord God and His Messiah Yeshua. This is what Scripture calls wicked and the way of the ungodly. The righteous put these things as central priority in their lives, and the unrighteous do not like it. This is why Rabbi Abba taught “The wicked finds no restful pleasure in the company of the righteous, but only in the company of the wicked.” Midrash Tehillim 125 Part 3 concludes saying, “Another comment, By the rod of the wicked is meant Potiphar’s wife; and by the lot of the righteous is meant the lot of Joseph.” The way of the wicked is in the desires of the flesh. This is why the rabbis parallel these things to Potiphar’s wife who wanted to have an affair with Joseph. We need a purity that comes only from the Lord in heaven. We can have this in Yeshua the Messiah if we ask for it! ד היטיבה ה׳ לטובים. יבא טוב ויקבל טוב מטוב לטובים, יבא טוב זה משה, שנאמר ותרא אותו כי טוב הוא (שמות ב ב). מטוב זה הקב״ה, שנאמר טוב ה׳ לכל (תהלים קמה ט). ויקבל טוב זה תורה, שנאמר כי לקח טוב נתתי לכם (משלי ד ב). לטובים אלו ישראל, שנאמר היטיבה ה׳ לטובים ולישרים בלבותם. היטיבה ה׳ לטובים. יכול לכל, ת״ל ולישרים בלבותם. 4. Do good, O Lord, unto the good (Tehillim / Psalms 125:4). The verse means that the good man will come and receive, on behalf of the good, something good from the All Good. The Good man will come, that is, Moshe will come, for it is said, She saw him that he was a good child (Shemot / Exodus 2:2); the All Good is the Holy One blessed be He, for it is said The Lord is good to all (Tehillim / Psalms 145:9); will receive something good, that is, the Torah, of which it is said, For I give you good doctrine (Mishley / Proverbs 4:2); on behalf of the good, that is, on behalf of the children of Israel, of whom it is said, Do good, O Lord, unto the good, and to them that are upright in their hearts. Because Scripture says, Do good, O Lord, unto the good, it might be supposed that the Lord is good to all who do good things, and therefore the verse adds good to them that are upright in their hearts. To the holy ones who are in the earth : – The form of expression is like (that of לאישׁ in) : “To a man (לאישׁ) as thou art thy wickedness (may reach)” (Job 35:8). And because I love Thee I love those who are holy, and I do good to them. Job said that the Lord loves those who set their hearts to holiness and righteousness. Radak says those who do (perform) God’s commands. The point is not to obey the commands by route, but to do so because of our love for the Lord and by His mercy, and by the power of the Spirit of God that indwells us. Midrash Tehillim 125 Part 4 concludes saying, “Because Scripture says, Do good, O Lord, unto the good, it might be supposed that the Lord is good to all who do good things, and therefore the verse adds good to them that are upright in their hearts.” The key phrase here is to those who are upright in their hearts. This is not about earning one’s salvation but about having the Holy Spirit of God leading us into His righteousness, justice, and truth because we are already a people who are saved! ה והמטים עקלקלותם יוליכם ה׳. אמר ריב״ל כל המספר אחר מטתן של תלמידי חכמים נופל בגיהנם, שנאמר והמטים עקלקלותם יוליכם ה׳ את פועלי האון שלום על ישראל, אפילו בשעה ששלום על ישראל יוליכם ה׳ את פועלי האון. (תניא רבי ישמעאל אומר) [תנא דבי ר׳ ישמעאל] אם ראית ת״ח עובר עבירה בלילה אל תהרהר אחריו ביום שמא עשה תשובה שמא ס״ד אלא ודאי עשה תשובה (אימר) [והני מילי] דברים שבגופו אבל דברים שבממונו עד דמהדר ליה (למלוה) [למריה]. 5. But as for those who note a turning aside unto crooked ways, the Lord will lead them away with the workers of iniquity (Tehillim / Psalms 125:5). Rabbi Joshua son of Levi taught, Any man who gossips about a lapse of disciples of the wise will fall into Gehenna, for it is said, But as for those who note a turning aside unto crooked ways, the Lord will lead them away with the workers of iniquity. Peace be upon Israel, the verse concludes, but even when there will be peace upon Israel, nevertheless the Lord will lead them away with the workers of iniquity. It was taught in the school of Rabbi Ishmael, If you see a disciple of the wise commit a sin during the night, do not think ill of him during the day, for he may have repented. You say, He may have repented? What you should say is, He surely repented. This trust applies to the repentance of the disciple of the wise for his bodily sins, but does not apply to sins which concern money until he returns the money to its rightful owner. In the midrash, the rabbis speak of the wisdom of the wise saying the application of God’s word is wisdom, and use the example, of the application of Torah to stealing, where one must return what was stolen in order to be reconciled before God. Eternal life is God’s gift to us. It is not something any of us deserve but the Lord does set certain conditions for us to receive this gift. Because of this, it is vitally important to our relationship with God and to our future that we understand this! There are verses in the Bible that tell us those who endure to the end will be saved (Matthew 10:22, 24:13) and if you hold fast to the word which is preached, then you’ll be saved (1 Corinthians 15:1-2) which is a repetition of the Torah command to hold fast to the Lord, to the Word of God, and to the commands. In addition to this, the Apostolic Writings teach us that the unbeliever cannot receive spiritual things (1 Corinthians 2:14). This means that he cannot believe them of his own sinful nature which is enslaved to sin (Romans 6:14-20). Once we are created new (2 Corinthians 5:17), we are able to exercise our faith in God. This is important because it suggests that our believing is the work of God, at least at the beginning of our faith walk before God. Our believing is also dependent upon our remaining in God’s Word and seeking the Lord God in heaven. The question though is whether a persons faithfulness is a by-product of the Lord working in his life or something he must work at? As we continue to live our lives for the Lord each day, we choose to continue to believe, but are we going to automatically be faithful and live our lives for Him simply because we have faith? The midrash suggests that it is possible for a person of faith, which is called a wise man, to turn aside unto crooked ways. We have heard it said, “salvation, eternal life, is God’s gift by grace, His loving disposition of favor and acceptance toward us, as it says in Ephesians 2:8-9 For by grace you have been saved through faith, and that not of yourselves; it is the gift of God, not of works, lest anyone should boast.” Now salvation is God’s gift, unearned and undeserved. Just as the Scriptures state, no one will ever be able to boast that he or she has earned or deserves the gift of eternal life. Salvation however does not stop at simple belief and grace. The question is whether we can we do things, or not do things, that disqualify us from receiving this gift of eternal life from God? The answer to this question is crucial to our relationship with God and to our future! Both the Torah (and all of the Tanach) and the Apostolic Writings reveal to us that God sets certain conditions for receiving salvation. Meeting these conditions will enable us to receive that gift, while disregarding and failing to meet them will disqualify us from receiving it. This is what the midrash is speaking of here. The Apostolic Writings speak of the authority for receiving eternal life is God’s Word and His Messiah Yeshua. Hebrews 5:8-9, speaks of Yeshua as the author of our salvation, “Though He was a Son, yet He learned obedience by the things which He suffered. And having been perfected, He became the author of eternal salvation to all who obey Him.” This is amplified by Yeshua’s statements in Matthew 7:21 where he says, “Not everyone who says to Me, ‘Lord, Lord,’ shall enter the kingdom of heaven, but he who does the will of My Father in heaven.” Yeshua makes it clear that merely acknowledging Him as Lord and Master, saying “Lord, Lord,” is not sufficient. Faith along doctrine misses the point and importance of being faithful to God! In order to inherit the Kingdom of God, we must do something. He says we must do the will of the Father. Yeshua wants us to understand that there is more to receiving eternal life than just belief system or a mental acceptance. Our conviction that He is our Savior must be more than just a warm, comforting thought or intellectual concept. Yeshua warns that simply calling on His name or recognizing Him as “Lord” is NOT enough. We see this illustrated in the story of the wealthy young ruler who asked what he must do to receive eternal life (Matthew 19:16). Yeshua’s response was obedience to the Torah and to give up his wealth because it had become an idol. (Yeshua responded saying, “If you want to enter into life, keep the commandments.”) Note that Yeshua did not answer that nothing is required other than believing in God or in Him. He told the young man he must obey the commandments of God to receive the gift of eternal life. This is plain and simple. The apostle James points out, belief is pointless unless it is backed up by action and obedience saying, “You believe that there is one God. You do well. Even the demons believe and tremble” (James 2:19). If we think that belief is all we need for salvation, we are sorely mistaken. As James tells us, the demonic spirits fully believe in the existence of the one true God and they believe in the power of the name of Yeshua God’s Messiah. They further know that Yeshua is the Son of God raised from the dead. The demons belief in this regard doesn’t mean they are saved! James goes on to explain that faith, belief, and trust in God, and obedience (faithfulness) go hand in hand saying, “But do you want to know, O foolish man, that faith without works is dead? Was not Abraham our father justified by works when he offered Isaac his son on the altar? Do you see that faith was working together with his works, and by works faith was made perfect?” (James 2:20-22). James thus explained the obedience of the faith which is necessary for our relationship with God to be a valid one. Without works as evidence of our faith, that faith is dead, worthless, and useless. The Lord God of Israel expects us to surrender our lives in return for the salvation that Yeshua provides for us as stated in Luke 14:26-27 “If you want to be my follower you must love me more than your own father and mother, wife and children, brothers and sisters, yes, more than your own life. Otherwise, you cannot be my disciple. And you cannot be my disciple if you do not carry your own cross and follow me” (NLT) Our love and commitment to Yeshua and our Father in heaven must be more important to us than this life and the things in this life. We must be willing to bear the cross, to put to death our sins and be willing to preserver in faithfully following in Yeshua’s foot steps. Midrash Tehillim 125 Part 5 concludes saying, “It was taught in the school of Rabbi Ishmael, If you see a disciple of the wise commit a sin during the night, do not think ill of him during the day, for he may have repented. You say, He may have repented? What you should say is, He surely repented. This trust applies to the repentance of the disciple of the wise for his bodily sins, but does not apply to sins which concern money until he returns the money to its rightful owner.” The midrash speaks of sin and repentance. Clearly the belief that all one has to do is believe and he will receive God’s gift of salvation, is a definite NO. His Word spells out certain conditions for us and is why the author of the book of Hebrews writes in Hebrews 2:3 exhorts us, that we not “neglect so great a salvation!” So, let us study God’s Word for the purpose of bearing the testimony of God, to bring glory to His name. Because Yeshua said, Luke 14:28-33 to be careful (with a warning) to consider carefully that accepting the gift of eternal life comes at the highest cost we can imagine. “So no one can become my disciple without giving up everything for me” (Luke 14:33, NLT). As Yeshua Christ gave His life for us, we must be willing to give our lives to follow Him! Let’s Pray! Previous articleBits of Torah Truths, Chol HaMoed Succot, חול המועד סֻכּוֹת, Is Faithfulness Required for Eternal Life? Next articleBits of Torah Truths, פרשת בראשית, Parashat Bereshit, A Doctrine that is sending many to Hell!